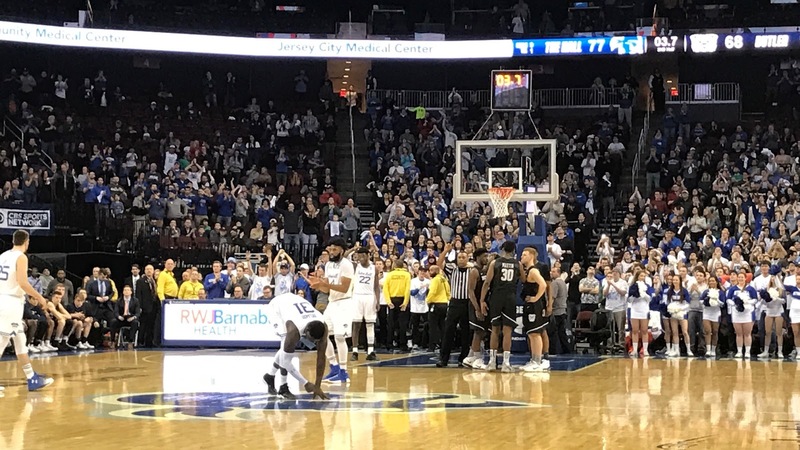 Seton Hall Head Coach Kevin Willard said of facing Butler again within five days, "It is weird, but it's better than playing someone like Creighton, to be honest with you. I mean that by -- we haven't seen Creighton since the seventh game, I think -- so from a scouting standpoint, the guys knowing what we're doing, we can really have four days kind of just working on us and understanding what we're going against, so I think for Butler, it helps; and for us, it helps." On Saturday night, Seton Hall honored their phenomenal senior class of Angel Delgado, Khadeen Carrington, Desi Rodriguez, and Ismael Sanogo. Willard said of the motive behind Seton Hall's senior night ceremony, "I just said on the radio, I think our fans were phenomenal. They got here early, they showed their unbelievable appreciation for four great seniors, and it was -- that's the best senior night I've ever been a part of, by far. Just -- not only the win was huge -- but just the emotions and the fans coming out and showing their appreciation, I just think that was very special." "It depends on who you ask. I will miss them dearly, but I think that's the great thing about what they've done here. They'll never be gone, I think that's the big thing. They're -- every recruit that we have that comes to watch us, those guys -- they always walk away and say, 'man, I can't believe how hard those guys work, I can't believe how much fun those guys have.' They've laid a great foundation for the guys sitting out, for the young guys. So even though their bodies won't be here, I think they've passed along what it takes to win at this level." In the game, it was Delgado, who had another double-double, the 71st of his career and 21st of the season. He had 21 points on a superb 9-for-11 from the field and 10 rebounds, to go along with an assist and a steal. Khadeen Carrington poured in 25 points on 7-14 from the field, including 3-3 from behind the arc, with four rebounds, three steals, and three assists. Rodriguez, still hurting from a leg injury suffered at Providence on February 21; and Sanogo were held out of this one to get them healthy for the Big East Tournament. Willard said of Rodriguez and why he was unavailable, "As most of you guys know, I'm very stat-conscious. He told me -- he said, 'Coach, I'm playing tonight' this morning, and he worked out this morning, he looked okay. I watched him shoot this afternoon before the game, and I said, 'how much can you give me?' He said, 'I probably could give you about 5-10 minutes.' And I said, 'I love you, but that's just -- I'm not taking the risk of you either hurting your other foot, re-hurting your foot, and going 0-for-3, no points and killing what he's had, a terrific year offensively. I made the decision that I was not going to play him." On Rodriguez's and Sanogo's availability for Thursday's Big East Tournament quarterfinal. Willard said, "I think Desi should be back by Thursday. I think that's the other big thing with the win, we get an extra day. Ish -- I'm not as optimistic as Ish is -- but I don't count Ish out." Seton Hall jumped out to a 6-0 edge early, and Butler came back to take a 25-24 edge with 3:58 left in the first half, which the Hall closed out with a 7-2 run to lead 31-27 at halftime. Carrington had 13 points, and Delgado 12, in the first half, accounting for 25 of the Pirates 31 points. In the second half, Seton Hall dominated, and they opened up a nine-point lead, 57-48, on a Carrington three-pointer. Butler battled back, and a Kelan Martin layup cut it to 58-54 with 4:47 left. Carrington gave Seton Hall their biggest lead of the night, ten points, 69-59, with 1:03 left. Martin made a three to pull Butler back within five, 73-68, with 18 seconds left, but Myles Powell made four free throws after that to close out the 77-70 win. Michael Nzei had a nice game for Seton Hall, with 10 rebounds and six points on 3-4 from the field. Willard said of Nzei, "MIkey's been phenomenal. Mikey's played this way all year. His minutes got a little cut down at times just because I thought Ish, defensively, was really playing well, but Mike -- when I talk about this group, I always include Mike because he's been just as special, just as -- a kid that's going to graduate with a 4.0 in the business school here, and that ain't easy. He's been great all year." Willard said of Carrington and Delgado's performances in their Prudential Center finale, "I just think it's who they are. It's what they've done their whole career here, it really is. I think -- I pulled out, I watched -- me and my wife sat on the couch last night and we watched one of their first freshman games, in a Big East game. It was almost comical to see them out there and to see where they started and where they are now, but they've played the same way all four years. They haven't changed, and I think they were going to do everything they could do tonight to make sure that we didn't lose the game." "I hate to say this, I was actually more emotional. It was the hardest pregame talk I've ever had. I broke down -- I had to go back in my locker room and I looked in the mirror and said, 'you gotta get your (blank) together.' And when they went out, I thought I got my stuff together, and I was sitting on the halfcourt. I looked up and I started watching the video, and the next thing you know, Sha (assistant coach Shaheen Holloway) looked at me and he goes, 'What are you crying for?' I said, 'I know you're happy. I'm not very happy right now.' It's -- they're like my oldest sons, they really are. I've been with them six years, technically. When you recruit them, then they're with you, and I spend more time with them for eight months than I do my own family. I'm just -- and as you sit there and you have such a feeling of pride because -- again, you've watched them grow, you're proud of what they've accomplished, you're proud of the men they've become, you're proud of the decisions they've been making, they're graduating -- two of them are going to be the first to graduate in their families -- there's just so many emotions that you go through that when you've been together with a group this long."